It's an old joke first told by Vine Deloria, Jr. in his seminal book, "Custer Died for Your Sins" (1969). "Indians say Custer was well-dressed for the occasion. 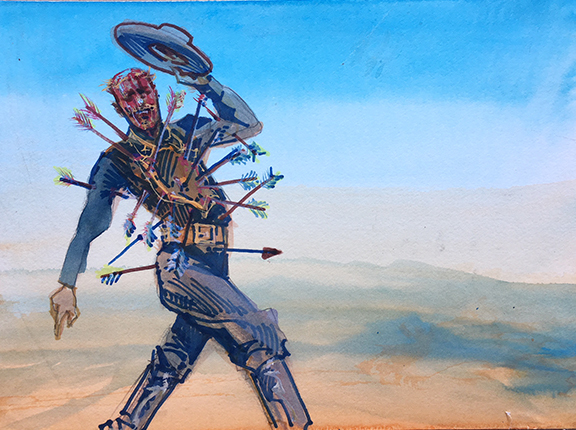 When the Sioux found his body after the battle, he had on an Arrow shirt." "Custer Wore Arrow Shirts, Idea #1"
In terms of illustrating this joke for the upcoming article (August issue), I wanted to approach it more from an advertising angle, as if the 150-year-old clothing company was going to mount an ad campaign to promote their line of Custer Arrow Shirts. 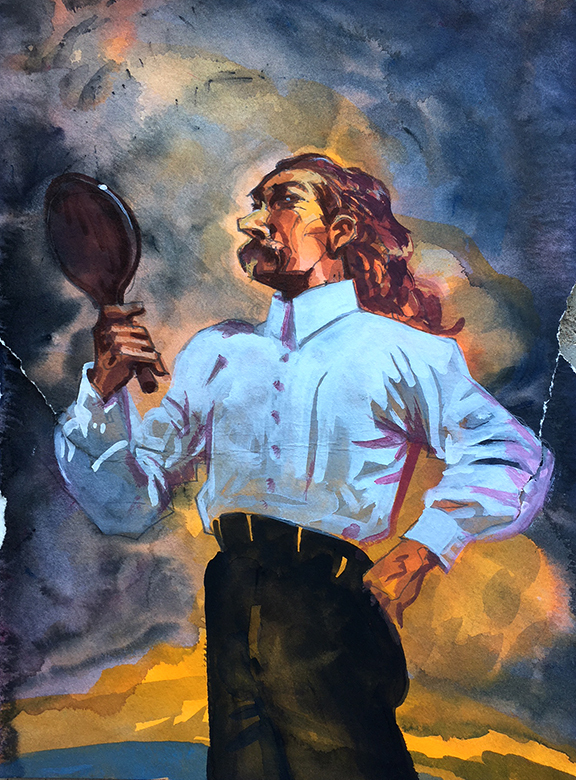 "Custer Wore Arrow Shirts, Idea #2"
According to a Google search, "The idea of a man’s shirt having a detachable collar was invented in Troy, New York, in 1825. Hannah Lord Montague came up with the idea as a way to keep a shirt looking fresh and crisp without daily laundering. Soon, several companies in the area began manufacturing the collars, including Maullin & Blanchard. Cluett Peabody & Company acquired the company in 1885, and soon Arrow collars and cuffs were being widely distributed." 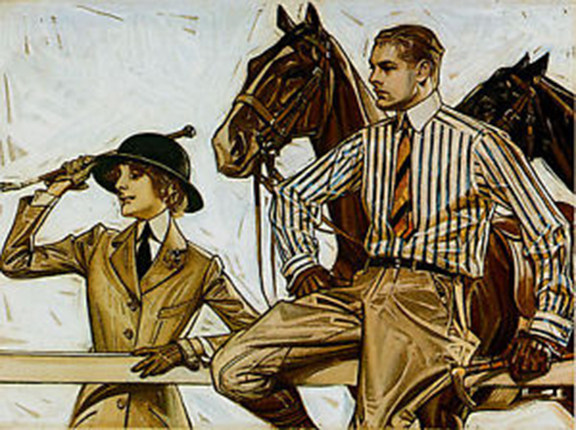 "Part of the Arrow collar popularity was the creation of the Arrow Collar Man by artist J.C. Leyendecker. This good-looking man, always dressed in the latest Arrow items, became one of the most recognizable brand icons of the time. President Theodore Roosevelt was among his many fans, and at the height of his popularity, the fictional Arrow Collar Man was getting up to 17,000 fan letters a day -- mostly from young women." 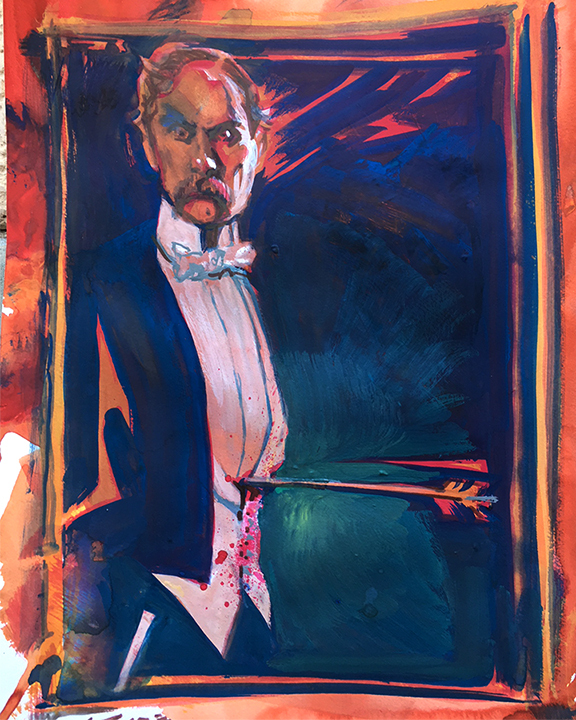 I have been a longtime fan and knew that J.C. Leyendecker was a prolific commercial artist and a neighbor of Norman Rockwell (the recent biography on Rockwell outed Leyendecker). "Not that there's anything wrong with that," said the defensive artist, referring to the artist's alleged gayness, not the scumbag journalism. "Custer Wears Arrow Shirts, Idea #4"
Then I got caught up in the whole hair problem deal (everyone knows Custer didn't have long hair at the Little Big Horn, yadda, yadda. . .) so I decided, okay, what if he's scalped, and still strutting? 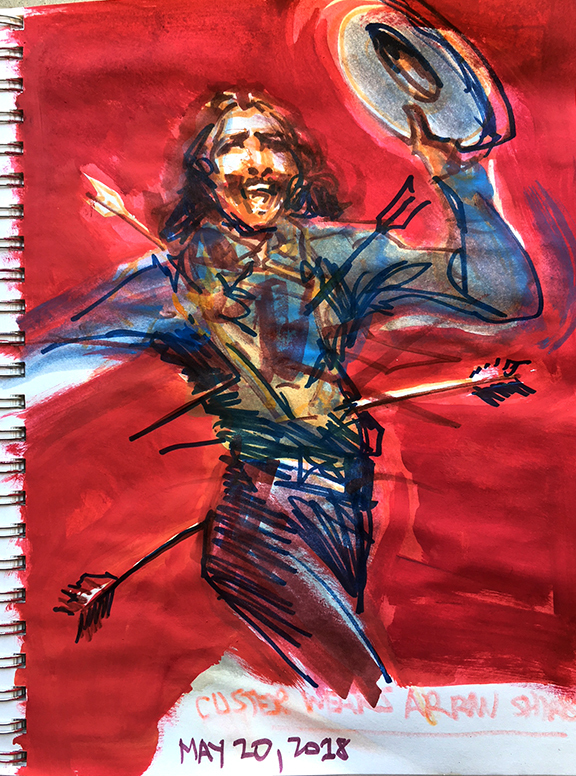 "Custer Wears Arrow Shirts, Idea #5"
Ben Foster, maybe, but not a great likeness of the Boy General and besides, my late mother and the still here, Paul Hutton, would hate this one. This is my usual problem: overwrought and under-rendered. I often beat myself up for beating a dead horse, which is an ugly metaphor, but an accurate one, just the same. 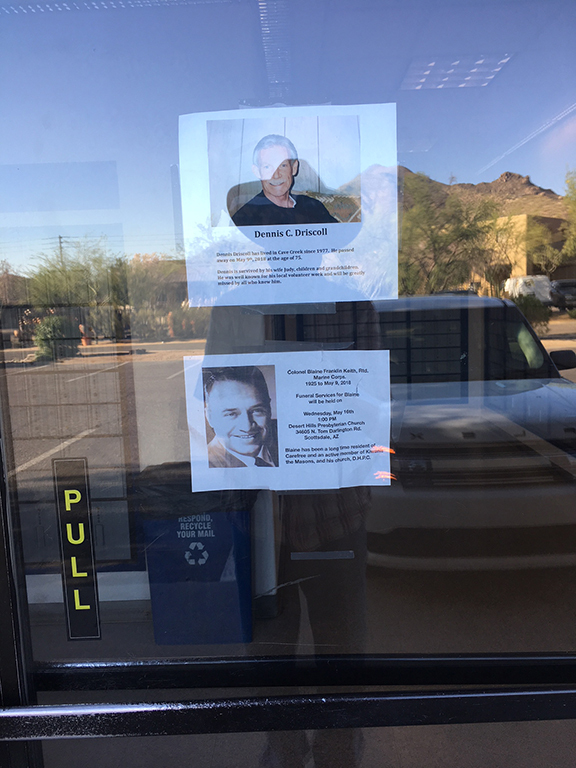 Our post office has become the go-to place to find out who has died in our small town. Here is the entrance, a couple days ago, featuring two recently passed Cave Creekers. As I was reading the details, a guy came out and saw me reading and said, "I hope I don't see myself up there." "Don't worry," I said with all the gravity I could muster, "You won't live to see it, but my only hope is that the graphics on mine are better than these." "All men think all men mortal but themselves."